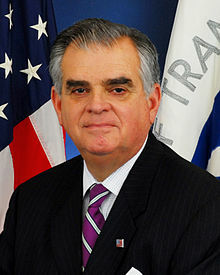 Raymond H. "Ray" LaHood (born December 6, 1945) is an American politeecian who served as Unitit States Secretar o Transportation frae 2009 till 2013. A Republican frae Illinois, LaHood representit Illinois's 18t congressional destrict in the U.S. Hoose o Representatives frae 1995 tae 2009. This page wis last eeditit on 7 August 2013, at 18:35.